1914 is the cut-off point for my book. Neat, because that’s 100 years ago, but the book does stray a little bit beyond that date at times. 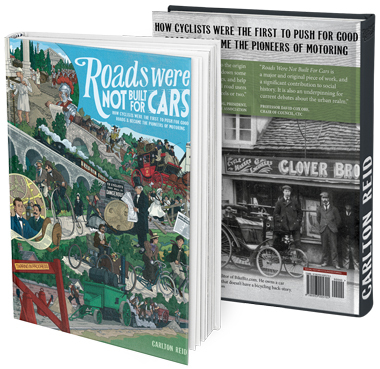 The cycles and automobiles chapter, for instance, mentions the Great War. There are a few things about this conflict that probably won’t get mentioned much by the mainstream media in this, the centenary year. Such as? 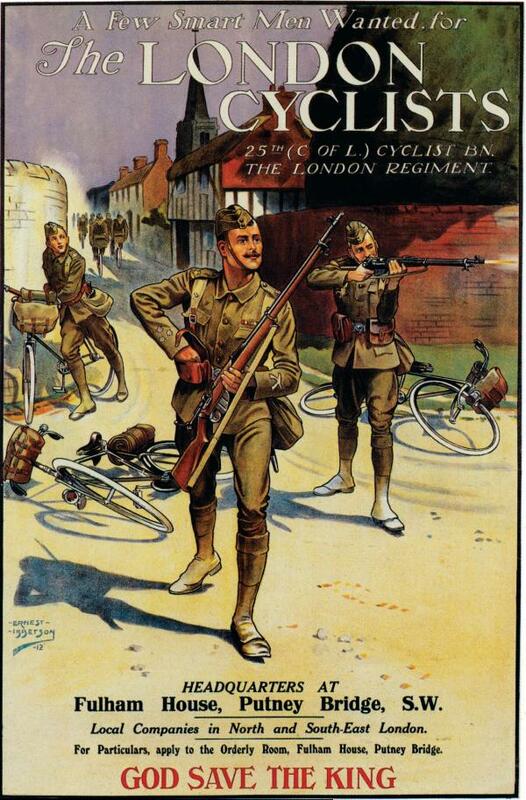 Well, Hitler was a WWI bicycle messenger (he like the war, hated cycling) and the first British soldier to be killed in this war, on 21st August 1914, was Private John Parr, a reconnaissance cyclist in the 4th battalion of the Middlesex regiment. (Parr’s grave faces that of George Edwin Ellison, the last British soldier killed during the Great War: he died an hour and a half before the armistice, on a patrol on the outskirts of Mons, Belgium). 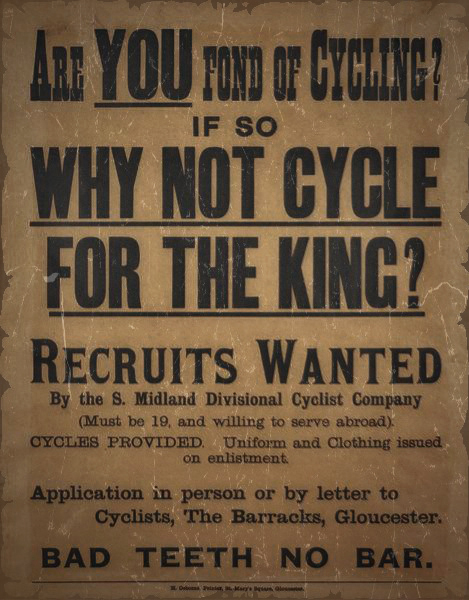 There were a great many cyclist casualties during the First World War because there were a number of cycling regiments, including the London Cycle Corps and the 26th Middlesex battalion and others. Yup, Adolf Hitler was a cyclist. In the First World War he was a bicycle messenger, as shown by his military records. This document says he was a “radfahrer”, a cyclist, not a motorcyclist, that would have been written “Kradfahrer” in military jargon. The 25-year old Hitler was a bicycle messenger for a Bavarian regiment, taking messages to the fighting units from the command staff. He was always keen to volunteer for dangerous assignments and had a largely charmed life, avoiding death on a number of occasions. Hitler’s time as an Austrian fixie hipster didn’t leave a good impression: when in power Hitler’s Nazi party enacted a number of anti-cycling laws, aiming to get cyclists off roads, leaving more space for the “peoples’ cars”. As for Hitler, all I can say is this: if it’s true that the Nazis passed laws attempting to remove cyclists from the road, what does that suggest about modern day cycling advocates, who prefer to do the same thing by lobbying to install bicycle paths rather than working to assert our full right to use the road? Just saying. It’s true that Nazis removed cyclists from the roads. Dutch people still say “give us our bikes back” if they want to insult Germans. Actually what the Dutch wanted was their bikes back, literally, as the Germans stole most of them in the latter part of WW2 when things were going badly for Germany. This is detailed in Pete Jordan’s book “In the City of Bikes”. The same book also states that it was the Nazis that *removed* bicycle registration in the Netherlands. Possibly the only good thing the Germans ever did anywhere although I have no doubt it wasn’t for a good reason. Pete Jordan’s book is rather brilliant. It is true that bikes are in fact not cars. However most roads are not made only for cars (the exception being motorways) but rather for the general purpose of allowing ease of transportation for people and goods, regardless of the engine. In theory, yes. However, in practice an awful lot of roads have been retro-fitted to be very unwelcoming to anything but motor vehicles, which is not the original purpose of roads. If paternity test were possible, you’d find that bicycles are more the parent of cars than, say, horse carriages.